A realistic, inexpensive, lightweight, child CPR trainer that offers all the essential features. Single pack includes: 1 Manikin,1 Soft Pack/Training Mat, 2 Faces, 2 Airways, 6 Manikin Wipes, and Directions for Use. 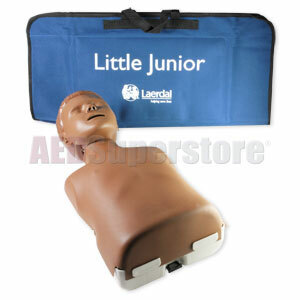 The Dark Skin Little Junior™ Manikin meets your need for a low-cost, lifelike child CPR trainer and is the perfect supplement to the Resusci Junior manikin.